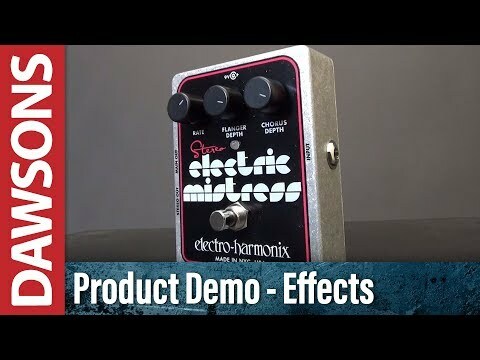 In the mid 1970s, Electro Harmonix introduced the first Stereo Mistress effects pedal and it became widely used by a number of well-known guitarists, from Andy Summers (The Police) to David Gilmour (Pink Floyd). This is the latest version of the Stereo Mistress Flange Pedal with some improved features to bring it up to date for modern requirements. Originally when a musician wanted to create a flange effect this would usually mean combining two identical tape recordings and slowing one of them down. This can provoke a range of unique tones such as swooshing, liquefying, or even air jet style sounds. Nowadays, these mesmerising sounds can be produced using an effects pedal such as the Stereo Mistress by Electro Harmonix. Compared to the older style Stereo Mistress pedals, this version is more compact in size and is encased in a robust die-cast chassis. It would also easily fit on a standard pedalboard, so you can include it in your gig equipment. This more recent adaptation takes a 9.6v DC adapter and features Stereo and Main out jacks, both ¼ inch as it often tends to be. The Stereo Mistress is equipped with three main controls which are Rate, Flanger Depth and Chorus Depth which individually contribute to creating a world of panoramic, hypnotising tones. The Rate dial also has a Filter Matrix mode which allows you to either manually flange the sound output or set it at a fixed point where you find its sweet spot. Whilst the pedal is on and you are establishing a range of new sounds, the LED status indicator flashes from red to green, almost like a human pulse, as an indicator of the rate of modulation. The Stereo Mistress digital pedal by Electro Harmonix is a superb flange effects pedal which has a huge range of sounds and tones on offer for such a small, sturdy unit.